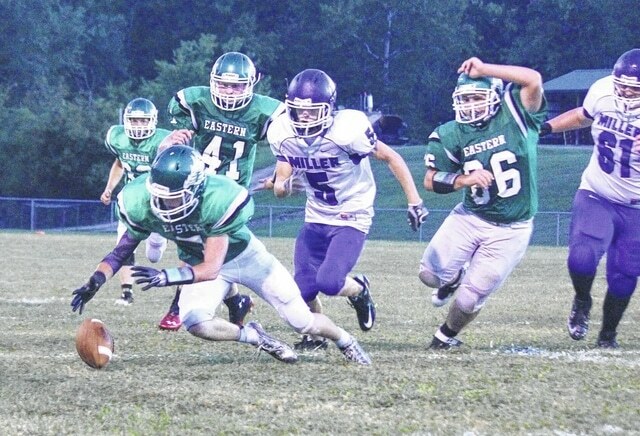 Eastern’s Cameron Richmond falls on a fumble as teammates Bradley Colburn (41) and Jacob Tuttle (66) look on during the first half of a Week 2 football contest against Miller in Tuppers Plains, Ohio. As the 2015 football season gets closer, the time has come to take a closer look at the football schedules in each county of Ohio Valley Publishing. Today, we will focus on the teams in Meigs County. The Meigs County squads are looking to rebound after finishing the 2014 campaign with a 14-16 overall mark, which included zero playoff appearances between the three local programs. Despite losing two of their first three games, both Meigs and Eastern were able to claw their way back to .500 after each team finished their respective gridiron campaigns at 5-5. Southern also finished its season at 4-6 overall. Here’s a brief look at each team’s 2015 schedule, as well as some notes headed into the fall campaign. The Marauders are looking to get back to their winning ways from the 2013 season, when the Maroon and Gold finished with a 7-3 mark. Meigs ended the 2014 season on a two-game winning streak and finished third in the TVC Ohio standings, despite being outscored by opponents by a 346-320 overall margin. MHS lost nine seniors to graduation, but the Marauders will come back with plenty of determined starters for the 2015 season. The Marauders, whose only appearance in the postseason came in 2008, have replaced non-league games against Coal Grove, Fairland and Ironton with contests against Jackson and Amanda Clearcreek, as well as the Week 1 opener against Gallia Academy. Mike Bartum will be entering his fourth season as head coach of the Meigs Football program. 4 at Amanda-Clearcreek, 7 p.m.
11 at Logan, 7 p.m. The Eagles are looking to build positive momentum gained during the 2014 season. Despite having a .500 record a year ago, the Green and White also dropped a trio of games by 10 points or less. Eastern finished fourth in the TVC Hocking standings with a 5-3 record and were outscored by a 274-200 margin during the 10 weeks of play. EHS lost 12 seniors to graduation and has a strong nucleus of players returning to the gridiron. It’s been over a decade since Eastern qualified for the playoffs, with only two appearances in program history coming in 2000 and 2001. The 2015 schedule is identical to last year’s by a week-by-week layout, with the exception of game location. Pat Newland will returning for his second season as the Eastern head coach. The Tornadoes are looking to get back to their winning ways in 2015. The Purple and Gold finished their 2014 season sixth in the TVC Hocking standings with a 3-5 record. Southern, which is 17-14 overall in the last three years, went 0-5 in road contests a year ago and was also outscored by opponents 182-179 during the regular season. SHS only lost four players to graduation, which leaves plenty of experience returning to the sidelines this fall. The Tornadoes’ only playoff appearance came in 2013. Kyle Wickline will return for his seventh season as the head coach of the Toranadoes. 29 at Notre Dame, 7 p.m.